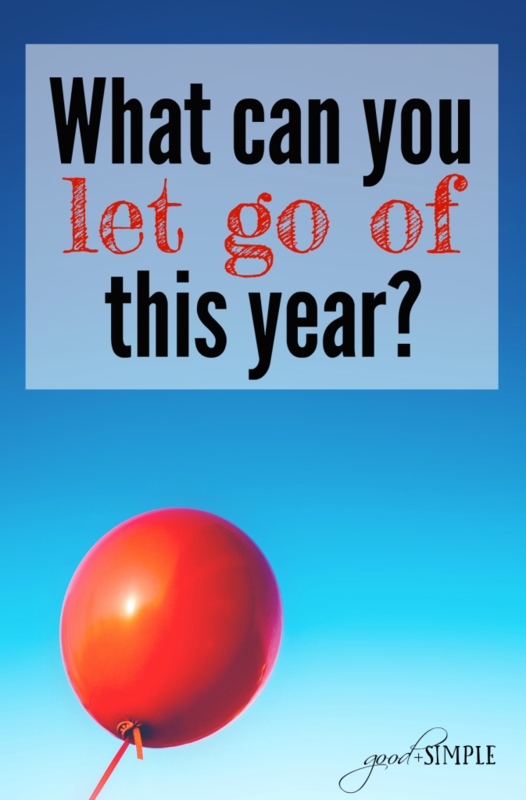 You are here: Home / Living / What Can You Let Go Of This Year? 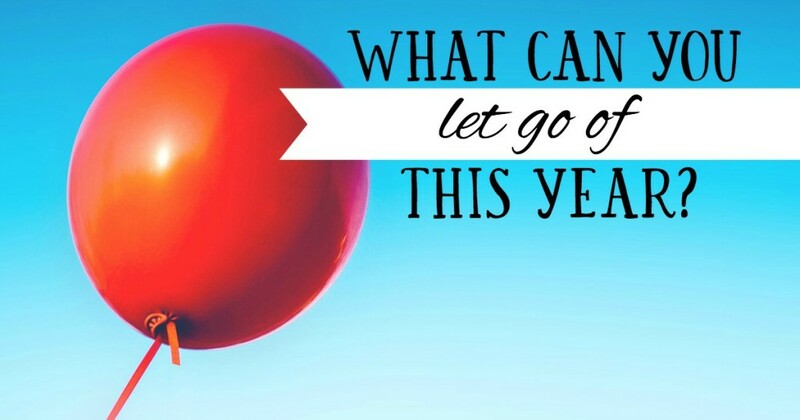 What Can You Let Go Of This Year? Over the last few days, I’ve watched the resolution headlines come pouring in. Some people love making resolutions, others hate it, and many of us (myself included) like the idea of making resolutions, but realize that having grand expectations for any given year often sets us up for disappointment. I think resolutions can be a good thing, but there’s one thing that bothers me about resolution-making. It’s almost always about doing more of something. Adding more to our schedules, being more motivated, or acting more disciplined. But most of the people I know don’t need more; they need less. They don’t lack motivation or resolve or discipline; they lack time and energy. They’re stressed, overscheduled, tired, and really, really BUSY. Sometimes when I am looking over my “to do” list for a given day, I feel a sense of doom. It just feels like too much to do at a reasonable pace, or I realize I’m somehow going to have to be two places at once, or barely have time to get from point A to point B. When that happens, I’ve learned to really scrutinize the list and figure out what can go. Sometimes it’s the dinner I wanted to make. Sometimes it’s a workout. Sometimes it’s a blog post. Sometimes it means one of the kids will have to skip their dance class that day. It’s not always easy to decide what should go, but as soon as I make that decision and cross off that one item, I instantly feel lighter. The day feels do-able instead of stressful. This year, I invite you guys to let go of something that’s been weighing you down — not just for a day, but for the year, or possibly forever. As we get ready to get back into the swing of things, return to work/school, and get back into a routine, think about what you’re looking forward to and what you’re dreading. If there’s something you’re dreading about your “normal life,” can you let it go? Maybe you cancel an activity that makes your week feel too hectic. Maybe you say “no” to some of the volunteering or socializing you’ve been doing. Maybe you ease up on your obligation to cook all the time or to have a dust-free home or to always get the “best deal” on everything you buy. It doesn’t have to be something that takes up time: Maybe it’s the nasty voice in your head that constantly criticizes how you look. Maybe it’s the need to constantly compare yourself to others. Maybe it’s always being “fun mom” for the kids by scheduling things when you really just want to read a book. Maybe it’s a relationship that’s no longer working. I personally want to let go of my constant need to multi-task. I used to take pride in my ability to do 10 things at once. I would make calls while folding laundry. I would read articles on my phone while waiting for the bus. But I’ve come to realize that my multi-tasking mentality is a hindrance instead of a badge of honor. One day when I was standing at the stove waiting for some pasta sauce to heat up, that familiar little multi-tasking voice told me I was wasting time. I mean, was I really going to just stand there for five minutes and stir?? So I started running back and forth between the stove and the computer, giving a quick stir and then reading an email, then another stir and then a quick perusal of an article that somebody shared on Facebook. After the sauce started to burn and I hadn’t even read half the article, I realized I had a problem. This year, I’m letting go of my need to constantly be doing and checking and thinking, and trying to give my full attention to one thing at a time. Spend some time analyzing what feeds you and what depletes you. Think about how much happier you’d feel if you didn’t have to sit in traffic on those afternoons or get to that store every week or feel bogged down by negative thoughts. See if there’s something you can cross off, cancel, or silence. Lighten your load, just by a little. And see if you don’t feel much, much better after you do it. Sounds like someone could use an adult coloring book!